In 2014, Madrid announced a progressive plan to ban all cars from many central areas as well as a more comprehensive ban of diesel-powered vehicles (which is becoming standard in many large European cities). 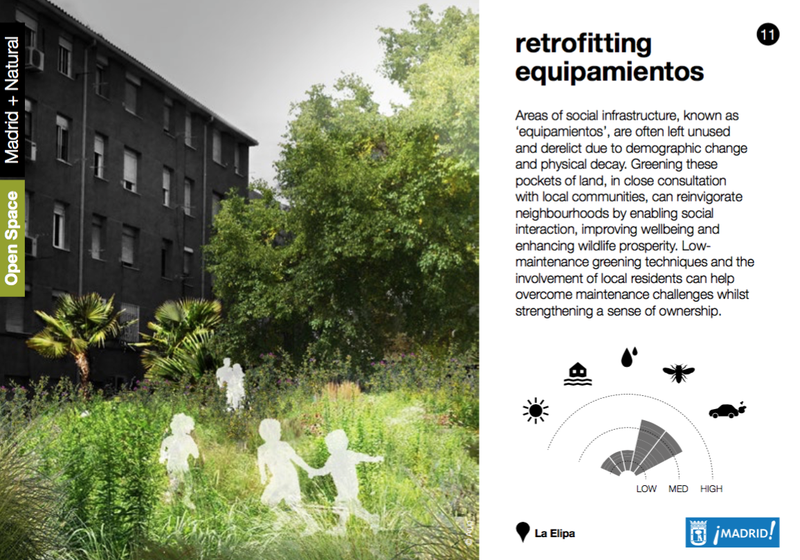 Now there’s the makeover the city needs to prepare for that future: the Madrid + Natural plan, announced this weekend by engineering firm Arup. In order to prepare the city for inevitable effects of climate change — hotter summers with less rainfall — Arup plans to counteract the root of those problems by cleaning, greening, and cooling the city on a very grand scale. That’s why a key part of the proposal is simply to plant more trees. Lots more trees, and pretty much everywhere possible. 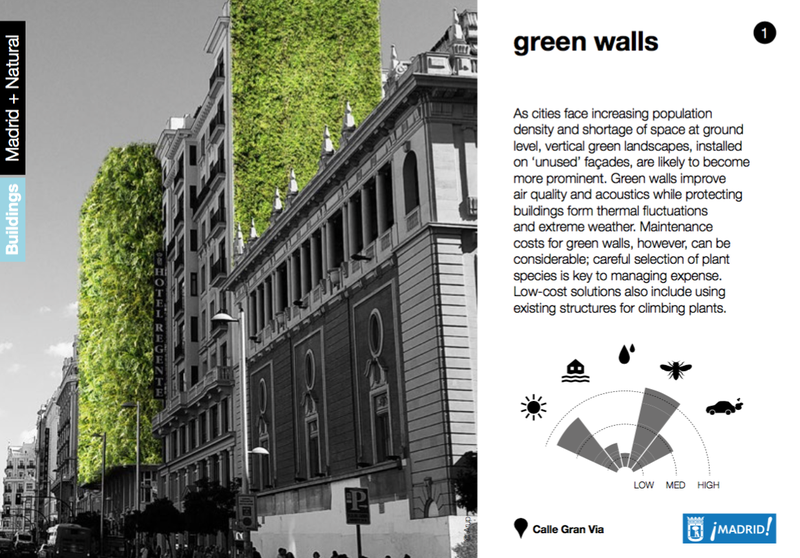 Green roofs, green walls, green infrastructure. 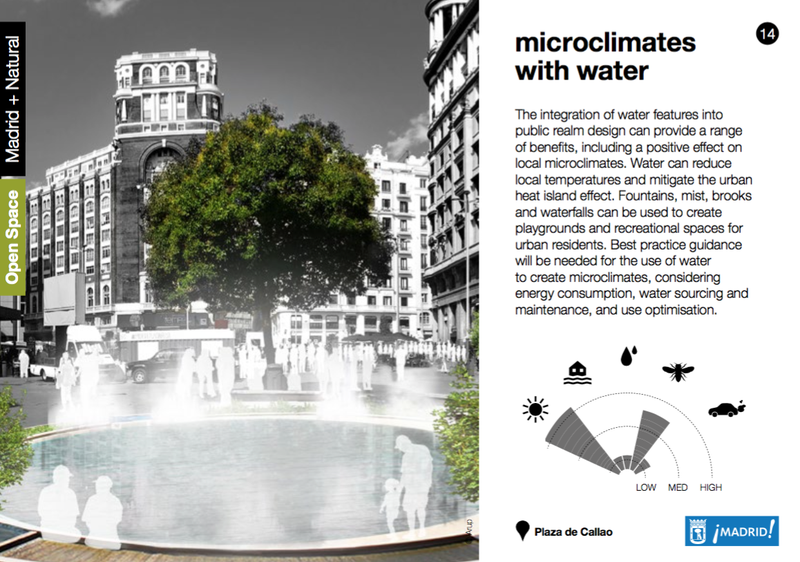 These will not only give people more enjoyable places for residents, but in some cases, swapping hot pavement with more permeable surfaces can help to cool the city at street-level. It also means capturing and storing water when it does rain in the form of gardens and fields — not storm drains that flush the water away. Most of all, I love the idea of “greenery districts” which are essentially heavily vegetated streets that can provide an oasis for wildlife in the city and also give humans a respite from the heat. Especially after the Paris climate talks, cities are trying to reduce their carbon footprints, but reducing or removing cars only solves half of the problem. You not only have to beef up transport options and build better infrastructure for walking and biking, you also have to re-green the city to reclaim that automobile property for people and nature. We’ve seen the same half-approaches in Milan, Delhi, and Beijing over the last few months when some or all of the cars have been removed from streets for a predetermined period: pollution is reduced, at least for the moment, but it always comes back.